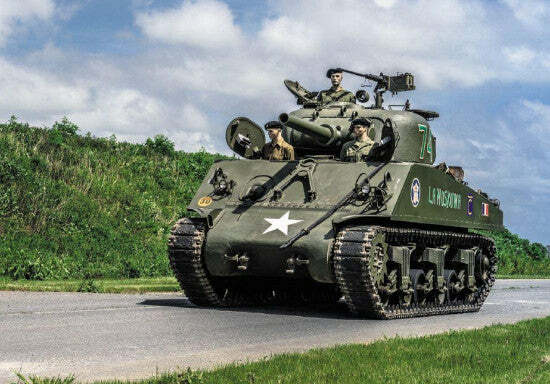 A selection of second world war tanks will sell at Artcurial, with a US M4 Sherman providing the undisputed highlight. It's valued at $220,000-440,000 ahead of the September 18 D-Day Auction in Paris. It's painted in the colours of the 501st infantry regiment, which was one of the forces behind the liberation of the French capital in 1944. The M4 entered service in 1942 and was lighter than the tanks the allies had used previously. It was designed primarily for manoeuvrability and speed, which made it highly effective on the battlefield. This example is fully operational. Other highlights include a Cadillac M24 Chaffee that was used during the Battle of the Bulge. It's expected to make around $156,000-275,000. The model proved so successful it continued to be used well into the 1950s, most notably in the Korean war. Matthieu Lamoure, managing director of motorcars at Artcurial, comments: "We are very proud to be presenting the D-Day Sale, a collection representing part of France's history. "The automotive industry is part of our cultural heritage, especially when the vehicles were involved in the war effort. "Collectors from around the world will be able to come and admire these exceptional pieces which have been brought together by a passionate collector." You can take a look a look at all our militaria for sale here.